SYNOPSIS - The protagonist of the story is Robert Bellamy, a man hired by the NSA to locate the several bus passengers in Switzerland who had accidentally seen a weather balloon with some top secret equipment (later on identified as a UFO) collapsing in the woods. As Robert locates the passengers one by one, they are mysteriously killed. Each murder has been meticulously staged to appear as an accident. Robert's marriage also dissolves, as his wife, starved for attention by Robert, marries a rich business tycoon Monte Banks. As Commander Robert Bellamy of US naval is in the verge of completion of his mission, he learns that he is being hunted by an unknown lethal force. Robert runs escaping from the attackers from Washington to Zurich, Rome and Paris. As the story unfolds to reveal Bellamy's past - why the women he loves cannot return his love, why his most beloved friends become his deadly enemies. Bellamy finally learns that the investigation ends in the place where he had started it...with an incredible conclusion. It was early days in my quest of buying every book I am planning to read to create a collection of my own, when I had a chance to get this title. Previous to it, I had been using libraries and have extensively been exposed to books like Da Vinci Code etc, who all focuses on the theme of an international thriller. In such books, the settings and facts are hard researched and they are interlinked and connected to each other with fiction plot and characters. The basic idea is to entertain the readers in a manner that they partially believe that such a set of events can/might actually take place. 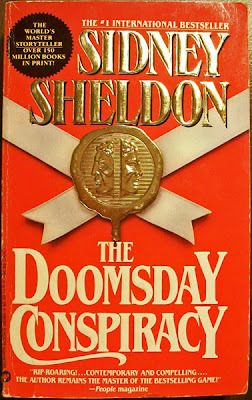 Sidney Sheldon's first book that I ever read was The Doomsday Conspiracy, It belonged to the same theme and It managed to catch my fancy and served me as a great entertainer from start to end. It was fast, had a tremendous pace, a hanging on the edge adventure smart plot; It was hard to put down even for once. The journey of the lead protagonist makes you fall in love with the way he displays his expertise in hunting people down in the first part of the book. In a dramatic manner, the hunter i.e. the lead becomes the hunted, for the second phase of the book. In all his runaways he manages to baffle those who are chasing him, and my god I love the ways in which he does that. Engaging and entertaining, the book holds you from your collar, till the whole saga and mystery is sorted out. The one lose hold, I personally felt was the way in which final element of aliens seems begging and a bit unexplained on certain notes. Nevertheless, this book is well worth the money spend, and I recommend this to everyone who loves entertainer thrillers. This is a must read for you people, trust me on this. The afternote will surely leave you thinking and smiling. PS - This came after Sidney had already written half of his works and they have all been published and appreciated well. Already a bestseller, he managed to explore the avenue of Sci-Fi for the first and the last time and did it in his usual classy way. It left so deep impact on people who read it, that Writers line Dan Brown after the release of his own first book "The digital fortress" publicly confessed Sidney's Doomsday Conspiracy to be the biggest influence in their set of thriller sci-fi writing style. RATING - 4.5/5. I personally loved this. Already having read all international larger than life thrillers of writers like Dan Brown etc, I expected this book not to surprise me in ways that it managed to did. The first book that I read of Sidney's, I became a fanatic fan convert of his work that very day. This is a master entertainers for those who are willing to explore the adventure of thriller novel. Power packed, fast and great time pass. PRICE - Paid 250 Rs to get the same after a session of bargaining at National Book Depot, Kanpur. PPS - Awesome layout FL, the look of the blog is professional know. Great pleasure being a part of it. Take care and god bless! Oh how i remember this book. This was my 2nd Sidney novel after Bloodline. I remember picking it up from a book fair almost 8 years ago.